I download emacs with 'sudo apt-get install emacs'. When I run emacs, I see emacs with too big fonts. I don't know why the default setup to have normal font size in emacs. How can I do that? You can press C-x C-+ and C-x C-- to increase or decrease the buffer text size. The value is in 1/10pt, so 100 will give you 10pt, etc. 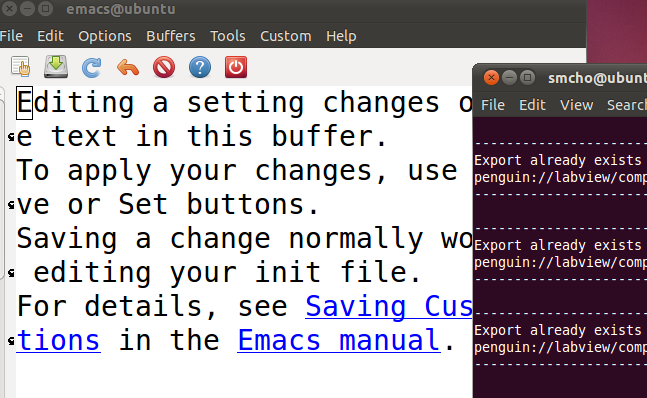 Source: How to set the font size in emacs? A slightly different way to do the same thing, by setting botht the font and size in one go, again in the .emacs file. If you want to use a differing font check it exists first or you will get an error message. Not the answer you're looking for? Browse other questions tagged fonts emacs or ask your own question. How to change the default font for Bless hex editor? How to change font size using i3-wm?